Rather than list safety tips, like these here, I'm sharing my recent story for a more personal connection to what kitchen safety really means. It all starts with you. 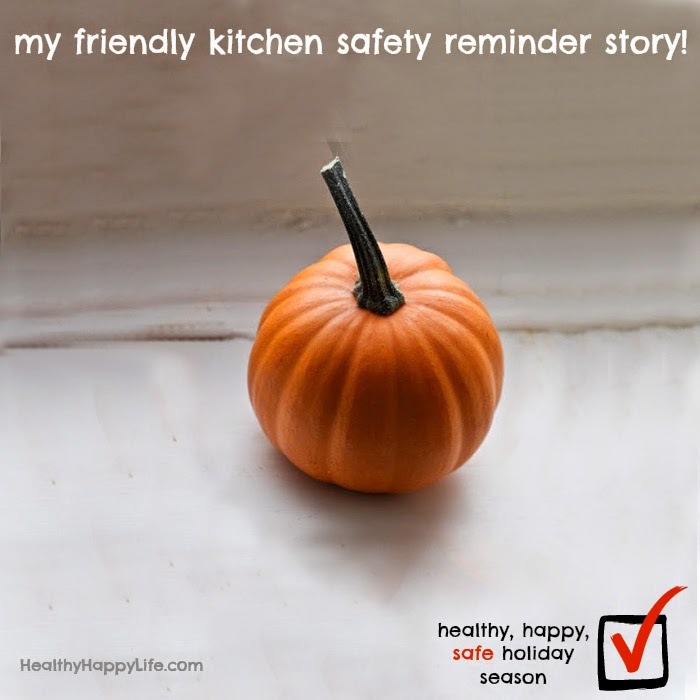 So aside from being my own seasonal version of a spooky storytime, this blogpost is also my friendly kitchen safety reminder, from me to you. If you plan on entering your kitchen this seasonal-goodies time of year, please please take a moment to read this post. Don't let a cooking injury slow you down this holiday season - or any time of year, really. My story will hopefully remind you to be extra careful in the kitchen. Well, it's officially pumpkin season. Normally, I would be blissfully excited, stocking my pantry with towering cans of pumpkin purée. My kitchen buzzing and humming, happily churning out endless platters of pumpkin muffins, pumpkin lattes, pumpkin rice, pumpkin pie, you get the picture. And yes, those recipes will still happen for me. But not via can. And not any time soon. You see, instead of pulling a batch of warm and fluffy pumpkin muffins out of a steamy hot oven, right now as I write this, I am collapsed on my couch, wrapped in a cloak of sorrow, aka my fuzzy sky blue bathrobe. And as the sparkly sun sets through blustery green bamboo stalks outside my window, I am using all my energy to write this simple blog post. And instead of typing eagerly with both hands, I am using my talk to type feature on my MacBook air, my right hand draped sadly at my side, thumb wrapped in a puffy white bandage. Here is the short answer of "why no more pumpkin cans?" - Well, I recently acquired pumpkin-can-a-phobia, aka a fear of canned pumpkin. Smirk and giggle if you must, I know it sounds silly. And yes I am making light of recent events and the ridiculousness of it all. But the fact is, a can of pumpkin can do some seriously scary damage if you are not careful. I unfortunately discovered this first hand, er, first thumb, last week. And thus, right now I seriously cannot look at a can of it without thinking about what happened. The story. Last Thursday started out so simply. All I wanted was a freshly baked pumpkin muffin.. I saw what happened and I immediately went into shock. Eyes wide, heart racing, adrenaline flowing. I felt no pain. I just saw the injury that just occurred and freaked out. After my internal stress-mode freak out, I screamed for my husband, who luckily had not left for work yet. I grabbed the dish towel off the kitchen counter, wrapped my thumb in it, tightly, and ran across the living room to tell my husband we had to go. Like NOW. I was very calm, yet very panicked all at the same time. I actually felt pretty good because I was, shockingly to me, in no pain. I mean, even when I get a tiny cut there is usually a little bit of pain. So this was strange to me. I decided that maybe it wasn't all that bad. I was wrong. Still wearing my pajamas, aka, fluffy aqua sweat pants and an oversized purple T-shirt, I pulled on some hot pink flip-flops, yes I was looking like a fashion diva at this point, grabbed my purse and rushed out the door with my husband. I have never in my life cared less about what I probably looked like. Messy hair, mismatched everything. As we raced out the door, my thumb was concealed, still clutched tightly by my left hand, wrapped in that faded pink countertop dishtowel. I didn't dare loosen my grip, with fear it would start bleeding uncontrollably like in a horror movie scene. We made it into our building's elevator. A man stepped in with his dog as we moved a few floors. I just stood there in silence trying to look normal. Oh don't worry sir, I'm just out for a morning stroll with my thumb wrapped in a dish towel. Keep on your way. I remember the dog giving me a sideway glance. Once alone in the elevator again, we pondered where we should go for care. Urgent care seemed like a good idea. My husband googled directions on his iPhone and we hopped in the car. Or almost into the car. About halfway down the elevator ride I started to feel very dizzy. Then walking through the garage, I felt it. I started to black out. Splotches of purple appeared in my vision and I felt very lightheaded, dizzy and weak. It is a scary thing, blacking out. I have only blacked out a few times in my life. Once as a child getting out of a hot tub too fast, and once at a very loud and crowded concert. But this was different. Luckily, I was able to pull myself out of fully passing out. My vision was completely purple for about 2-4 minutes, but I never lost consciousness. It was strange. It was scary. And all this for a darn pumpkin muffin. But the worst was yet to come. Deep breaths. I propped my feet up on the the dashboard of the car to help blood drain to my head. They always say to keep your feet elevated if you feel like passing out, right? Well, it worked and I started to feel a little better although now my finger was starting to throb in pain. Great. We made it to Urgent Care and rushed into the waiting room. The receptionist looked at my hand when I said it had been cut badly, and asked me if my thumb was cut off. I responded with a surprised, "No!" I was thinking to myself, would I really be this calm if my finger had actually been cut off? No. Way. At least I am not THAT guy. After a few minutes I was taken back to a room. After telling the nurse that I briefly passed out, they told me to lay down and laid down is how I stayed for the rest of my time there. And from there, it was pretty much how it always goes when you badly slice your finger. They take your vitals, ask you questions, clean your wound, and let you know what they need to do to get you on your way. The doctor told me I needed stitches. I have never had stitches before so on some twisted and ridiculous level, I was excited to check that off my bucket list. Dumb. I am rolling my eyes right now at that notion. Going through life without stitches is a much more enjoyable route guys. I was gravely warned by the doctor that the local anesthetic, via the numbing needle procedure, would be the worst part. Hm, how bad could it be? No worse than novacaine at the dentists office, right? Well to put it simply, those numbing needles, at least three long pricks of them were by far the worst pain I had EVER experienced in my life. I felt like I was in a horror movie as my body clenched up, twitching in pain as I screamed out uncontrollably. Things like, "oh my god this hurts so much!" "owwwiiie!" "Oh. My. God." and "Oh my gosh. OhMyGoshOhMyGoshOhMyGoshOhMyGoshOhMyGosh" came out of my mouth. And my favorite swear word definitely made an appearance or two. Two hours and seven stitches later I was ready to be sent home. I took some Advil and had a rest day, blindly thinking that my body could have super powers and heal overnight. But after six days of stitches, healing, endless amounts of pain, Neosporin, arnica pills, gauze, hand cramps, stitches pain, swelling, wound checks and infection scares, I am now realizing this is going to be a long process of rehab. This entire experience has been a bold reminder of how fragile our bodies are. And how one accident can wipe your schedule and change your "to-do" list for a while. So yeah. It's been a process. I've watched a lot of Netflix, finishing the OUAT series just in time for Sunday's season premiere. Taken a lot of Advil, something I avoid at all costs. Tried desperately to keep up with work, typing and texting with my left hand only. Cried in frustration. Whimpered when I could not put my hair up in a hair tie with one hand. Go on ladies, try it, it's impossible I tell you. Cringed at the site of my Franken-thumb. And acquired a very intense fear of open, sharp-edged can lids. Like I said, no more cans of pumpkin for me this season. I will gladly be using the box, tetra pack version, pumpkin ... or making homemade puree. Problem solved. Friends, the moral of my not-so-Charlie-Brown , great pumpkin story is this: kitchen safety is no laughing matter. There are 1 million ways you could injure yourself in the kitchen. I had at least three people, in the past week, tell me that they similarly sliced their fingers on an open can lid. And a few other friends telling me their horror stories of slicing their fingers with knives while chopping. Other kitchen cautions include slipping on wet spots, oven burns, mandolin or peeler finger cuts, electrical shocks, broken glass accidents and more. Perspective. It is just my thumb. I will heal. And while I may have a bit of permanent nerve damage, only time will tell, I got away pretty lucky! The kitchen injuries can get much worse, and I am thankful to have health care, a helpful husband (literally my right hand man through this) and a job that is flexible to life's ups and downs. So, me, I'm good. No pity party here. You. To anyone and everyone entering the kitchen this holiday season, please please proceed with caution. I tried to take a shortcut by skipping the can opener, and it did not pay off. Shortcuts, bad decisions, risks, are all things you should avoid when cooking in the kitchen. Stay safe everyone! And have a healthy happy holiday season, filled with delicious, home-baked goodies. And with that, one of my fave fire-hazard kitchen safety vids..